Most people will probably say harvesting is their favorite part of gardening, but my favorite part of growing plants is seeing the seeds sprout. I plant the seeds in the ground and come back every 20 minutes to check if they sprouted. I know they are not going to sprout 20 minutes after I planted them, but I just have to check. 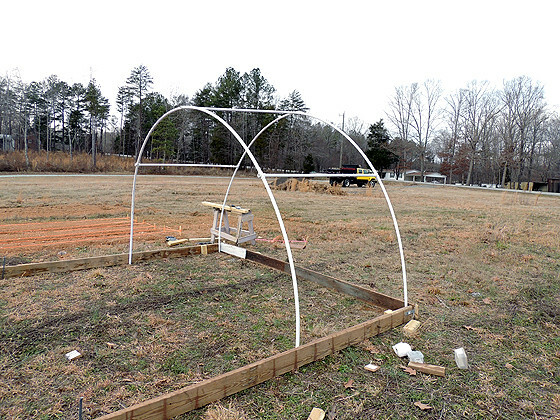 Note – read on, but beware, this is what happened to this greenhouse a few short weeks later. If you live in an are that gets snow in the winter, I will not recommend you use PVC. 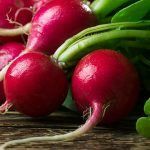 So last year, after I made the decision to start farming our land, I had to come up with a plan of how to get to the Farmer’s Market as early as possible with a nice verity of vegetables to sell. 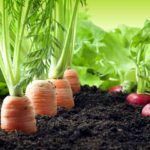 I met with my county cooperative extension agent on our land, which was just a cleared field back then, and as we were talking he suggested that I will purchase seedling from a farm in VA. This didn’t appeal to me so much. I didn’t want someone else to start the plants for me. I want to see the seedlings sprout. But I don’t have $4000 for a commercial greenhouse. 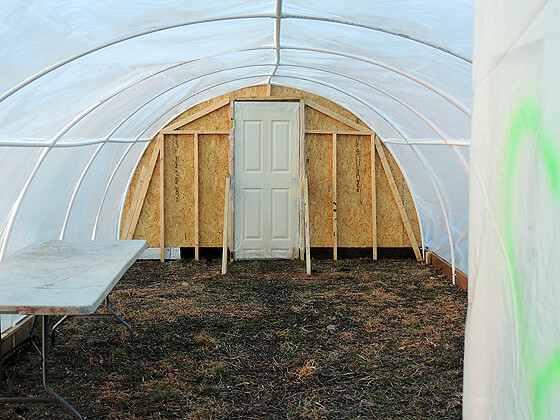 So I started looking around and watched many YouTube videos of people who built their greenhouses. We were looking for something that we can do ourselves in a couple of days, something that will be big enough for a small farm, and that will cost us the least amount of money. We decided to go with a PVC greenhouse. We know this is not a greenhouse that will stay standing for many years, but if it last three years until the farm take off we’ll be grateful. 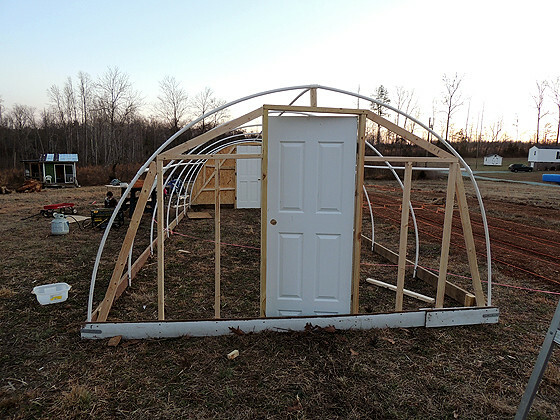 This 12’x30′ greenhouse cost us a little over $300 because we had some lumber and a door laying around that we could use. If you have absolutely nothing to recycle, it should cost you about $360.66 + your local sales tax. 2 doors – better to buy storm doors. If you get an indoor kind of door, make sure you either paint it or cover it with plastic. We used leftovers from out greenhouse film to do that. Don’t buy new doors! There are a gazillion doors on Craigslist, and you can easily find a very cheap door or even a free one. I calculated them at $20 each = $40. 6 mil Greenhouse film – $67. 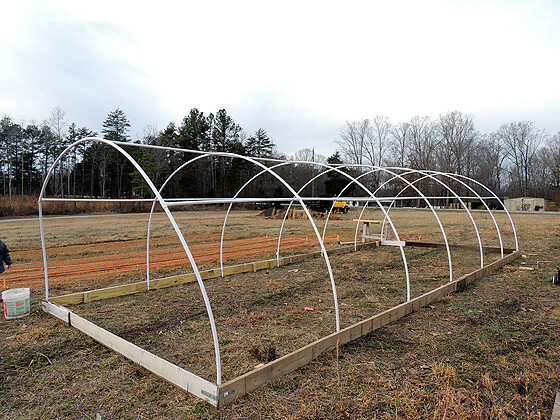 Everywhere that I looked online, greenhouse film cost about $113 for a clear 6 mil 20’x50′. I was about to order when I decided to check my local farm store (Southern States). They didn’t have it in the store but were able to order a 6 mil 20’x100′ clear greenhouse film for me for $67! I might go ahead and add another layer of film in the near future, but so far we covered the greenhouse just once. Call around before you order online. The film must be at least 6 mil (better to go with thicker if you are in areas with heavy snow), and 20 feet wide. Buy at least 60′ of the film. Please note, we love building things ourselves, but truth be told, we are not very good at making them pretty. They will always be a 100% functional, but pretty? Not so much. As we were nearing the end of the project, I asked my husband how come we don’t try to make things pretty. He gave me the look, the one that says “I’ve been working on this thing for two days and you dare to complain?,” and sent me to the other side to work on attaching the greenhouse film. 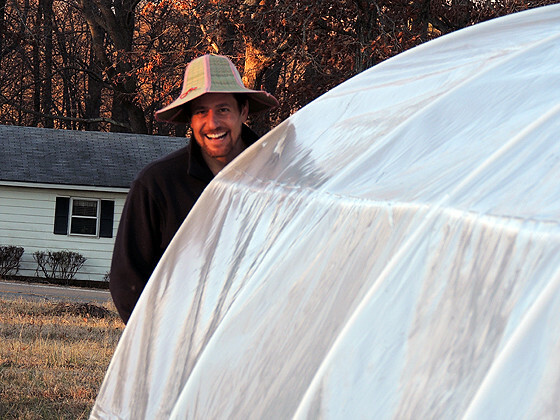 When he was done, he joined me, all smiling, and announced that he made the greenhouse pretty, just for me. 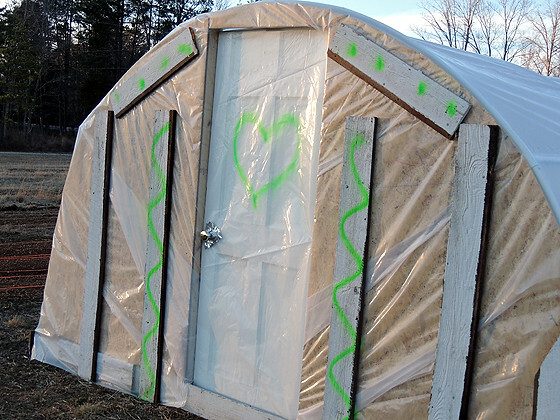 I was shocked to find no less than a bright green, awful, heart graffiti on the other end of the greenhouse! I had to look around to make sure I’m not in one of Philadelphia’s subway stations. He ended up making flowers on the other end. Don’t leave your husband alone with a can of paint. Don’t ask questions you might regret later. Don’t leave a can of paint alone with your husband. 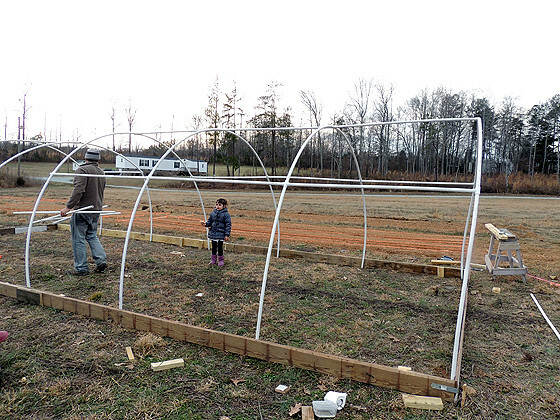 With a little work, you can make this greenhouse much prettier than we did. We started by measuring the lengths and the diagonals of the rectangle. The shorter lengths are 12′ each, and the longer ones are 30′ each. The diagonals must be equal. 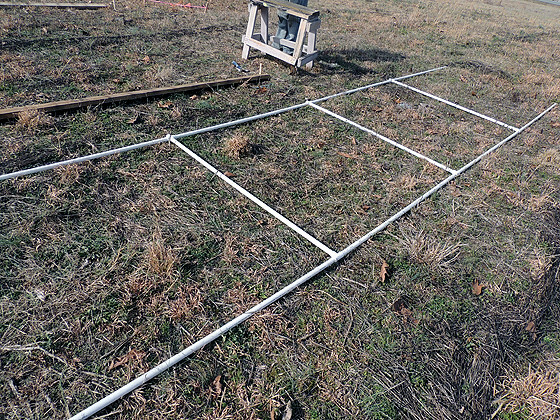 Then we built the frame from 2x6x16s and some reclaimed wood we had laying around. If you have to purchase everything, you’ll use the 2x6x16 lumber for the long lengths (2 for each side, shorten each one by 1 foot), and 2x6x12 lumber for the short lengths. 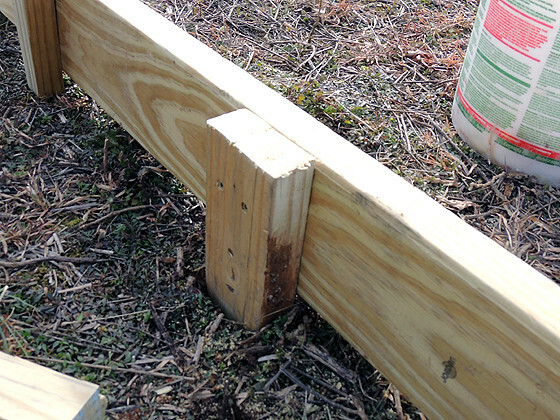 Next, we secured the frame by hammering a few pieces of leftover lumber into the ground and screwing the frame to them. 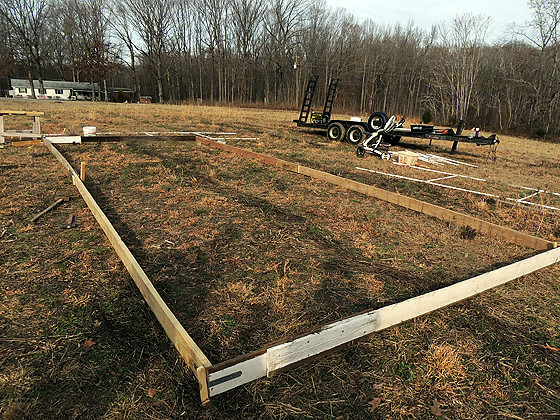 We positioned the rebars every 5′ down the two long lengths of the frame. Now the frame is ready for the PVC. 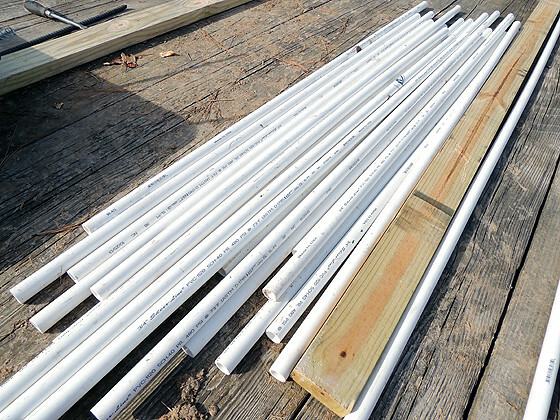 So we were left with 46 5′ PVC pieces. Each line in the picture above represents a 5′ PVC pipe. We started by assembling sections 1, 2, 3, and 4. 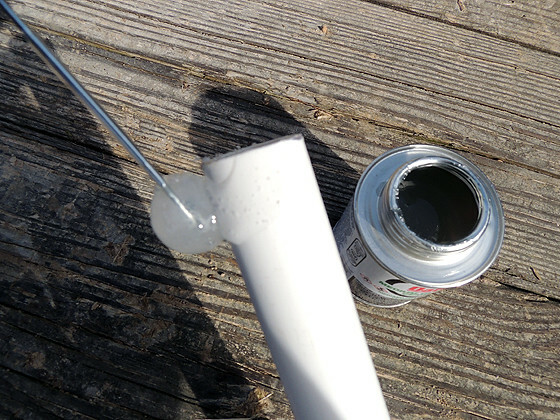 Use Oatey PVC Cement to coat the end of each pipe and the inside of the joints. 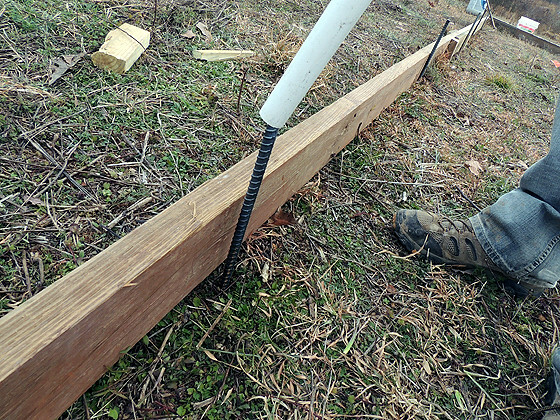 Then, you just push the pipe into the + or T joints and let it dry for at least 30 minutes. (Note, it is better to do this a few hours before you install the hoops to make sure the cement it completely dry). 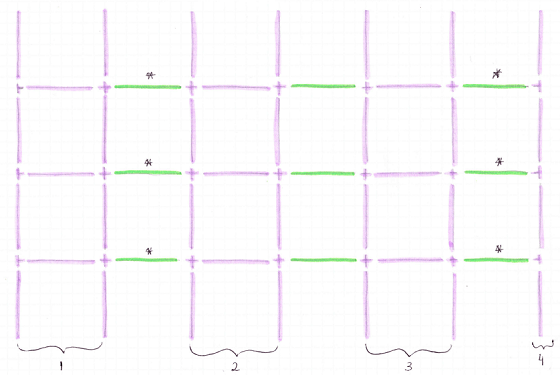 We ended up with three sections that look like the one in the picture above (1, 2, 3) and one end section (4). 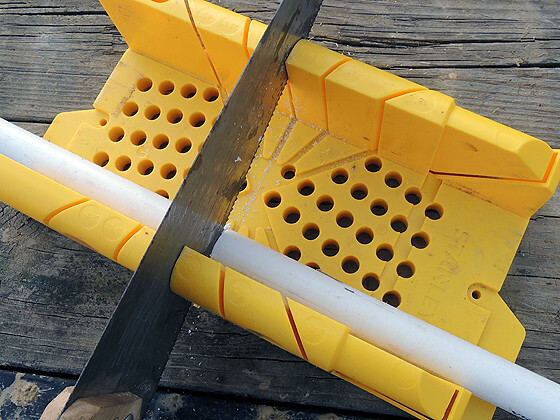 Make sure you make those sections on a flat surface, so the opening of the T and + joints all point in the same direction. To install the hoops, you simply slide the pipes over the rebars. Here is the first hoop going up. 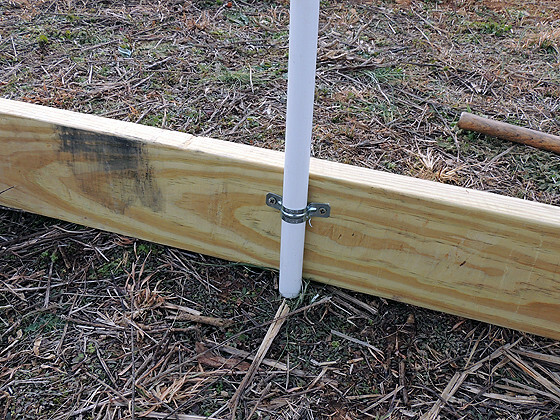 After you put sections 1, 2, 3, and 4 up, you connect them with the remaining 5′ PVC pipe (the ones marked in green in the diagram above). Notice one thing here; since each of the + joints adds about an inch, we ended up with the last hoop pushed out of the frame. To fix this, we shortened the pipe sections that have a star above them in the diagram above. Next, we secured the pipes to the frame with the rigid straps. The ends were the most amount of work. 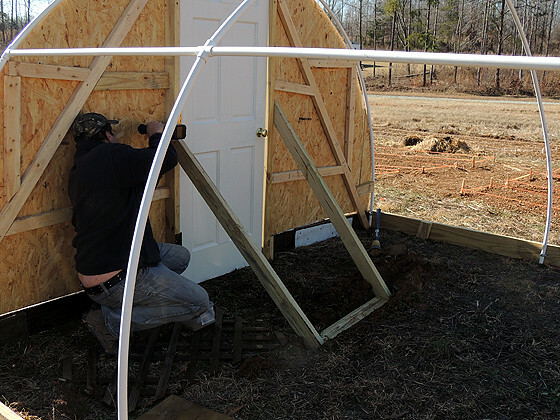 We built a frame for the door and a frame to hold the plywood. We ended up adding more support since it gets real heavy with all the plywood. 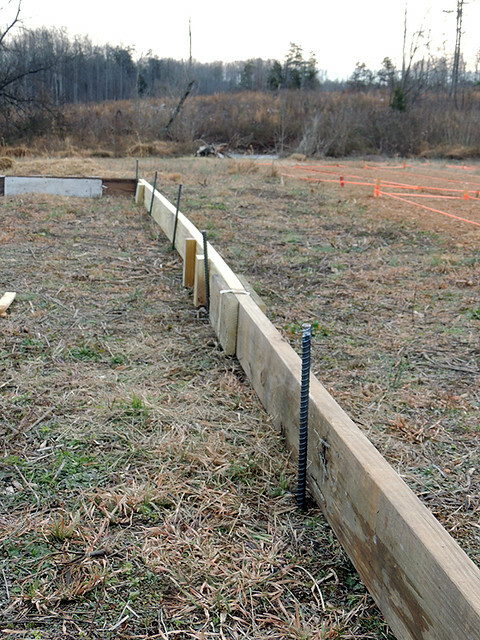 Looking back we should have dug two holes for the 2x4s that make the door frame and bury them in the ground like you will do with fence posts. 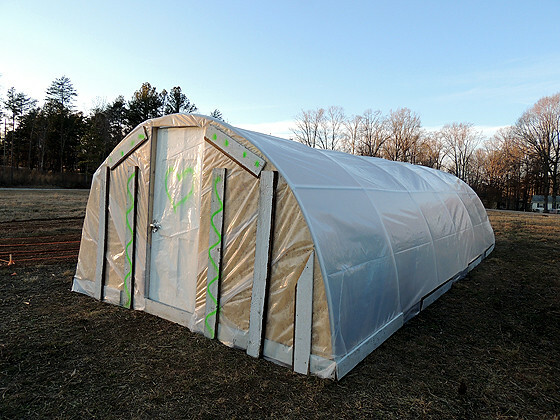 Lastly, we covered the whole thing with 6 mil greenhouse film (since we used untreated plywood and indoor doors we covered them as well. Try to use a storm door if you can find one. You can also paint the plywood and door instead of covering them with plastic). We secured the film to the frame with a stapler gun and then added leftover pieces of wood around the outside. We screwed those to the frame so the film is between those pieces and the frame. It gets very very hot in there. It is very important that you have two doors or at least a door and a window. You will have to open both ends on a warm day if you don’t want to cook your plants. The plants also will benefit from air flow. I think I will cover the ground with a thick layer of mulch, so I don’t end up with a jungle inside the greenhouse. We will also build tables and a potting station inside. This project took us about 2.5 days, and we have three little kids running around. So for $360 and two days of work you can have a very nice size greenhouse to start plants early. I can totally relate to “the look” from your husband! Thanks for sharing your plans, a great cheap, quick, and functional model. Thanks for a great article. The photos and directions are easy to follow and helpful. Your sense of humor makes it seem easier than I’m sure it was. 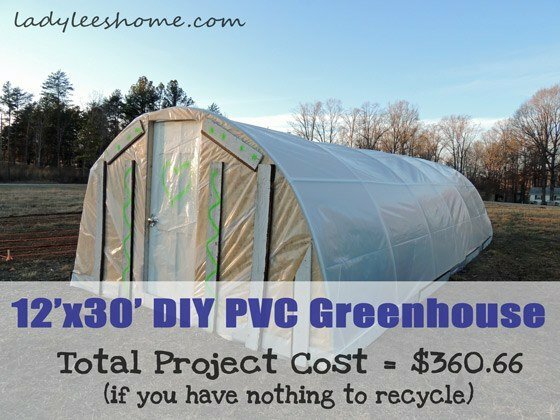 Thanks for sharing this affordable option to having a green house. You are welcome Rhonda! Thanks for stopping by. Feeling better every day thanks to some loving friends!!!!!!!!!!!! Thank you so much for caring, and also wow. You guys are amazing, what a project and can’t wait for our next trip to your place. I bought a few seed pacs the other day. Did not buy heritage seeds this year yet. Hope to get them going in March. I can’t wait to show Greg your green house and go much smaller here for a potting shed sized green shack. This will help me feel better quickly. Love the garden but I stink at it. So happy you are feeling better Debby! We will be working at the farm this weekend and it should be nice outside so feel free to come visit if you are strong enough. Almost all my seeds this year are either organic or heirloom. I am excited to see if there will be a difference in the growing experience. But, can you leave your husband alone with a can of paint? 🙂 Totally my favorite on From The Farm! I love this!!!!!! LOL! Obviously I can’t leave mine alone with a can of paint. Fantastic project! 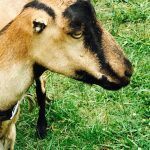 Thanks for linking up to Awesome Life Friday! We will be pinning this post – can’t wait to see what you’re sharing this week! Thanks again for joining us at Green Thumb Thursday last week! Hope to see you this week too! Oh I wish I had the room for some thing like this!! But I just have to settle for mini hoops and cold frames in my small garden! Very cool thanks for the post!! 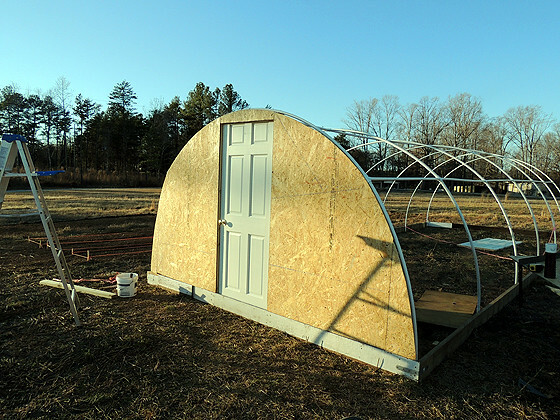 You can still do a lot with simple hoops and cold frames! Thanks for visiting. Love this!! 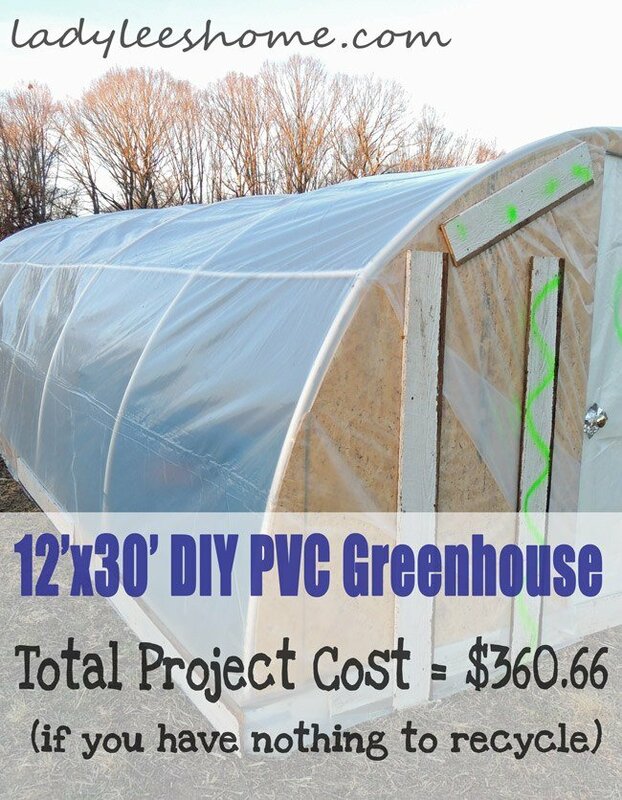 I really want to do a greenhouse, we could never fit this in our yard (epically tiny suburban plot) but I think it would scale down nicely for our needs. 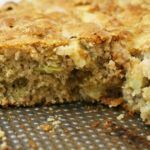 Thanks for adding this to the Homestead Blog Hop! Hope we see you again this week. Lol! You can add to it or make it smaller. Pretty easy to play with it. Thanks for visiting. Husbands are like that, yes they are. But we love them and they do the heavy lifting so we keep them around. Your greenhouse is terrific and it is pretty. After all, Beauty is form and function meeting.